the World Wide Web, not the Wealthy Western Web.
} (These are all the defaults. F le x box vs. CSS Grid? Bot h super powers are u se ful . Which do you want? browsers that do not understand CSS Grid. Leverage the 2012 Grid implementation. Pretend IE has no Grid. Comma , or not to comma? 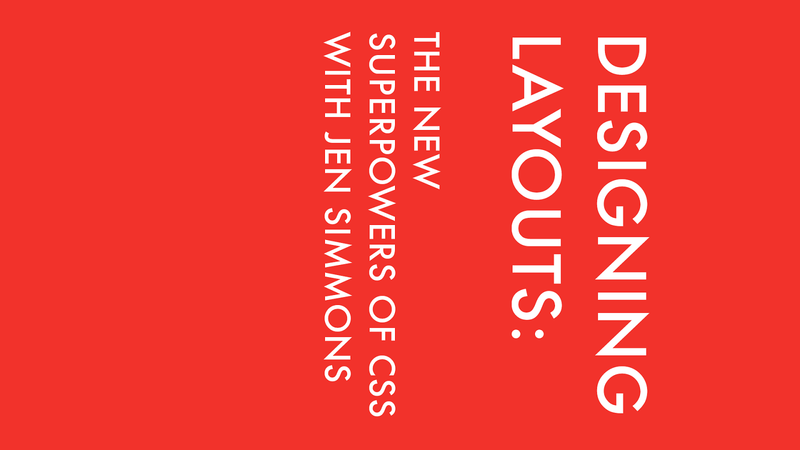 View Designing Layouts: The New Superpowers of CSS on Notist. Everything about web page layout is about to change. A plethora of new CSS properties for layout is about to give us super powers for building web pages. It’s as big a change as when we left behind tables for CSS—maybe bigger. There is an incredible amount to learn, including entirely new concepts of layout behavior. Want a head start? Join Jen Simmons as she walks you through the most important new CSS properties, and shows you how to combine them into real-world usecases. Learn how to write the code for CSS Grid, Writing Modes, Alignment, and more. Gain a new and powerful toolset for page design. Learn a process that simplifies the complexity and allows you to get to the matter at hand. See concrete examples of innovative layouts. Leave with a vision of what’s newly possible and where the industry is going. This full-day learning experience is for anyone who has a hand in designing or developing web pages: product managers, graphic designers, interface designers, experience designers, and front-end designer/developers. You may already be proficient at CSS, and want to learn the new code. Perhaps you do not know CSS, and would like to learn some. Maybe you don’t really even want to learn CSS, but you want to understand the new possibilities, so you can better direct the design process. If any of these situations sound familiar, this day is absolutely for you.